One of the many benefits of being a parent of young children is that you have a regular incentive to rise early. This means that on a Saturday morning when the cupboard is bare and there is nothing for breakfast, you can go to the bakery before they really open. Poor, sad, childless couples sleep in on Saturday mornings and go to the bakery after nine to be served at the counter by some teenage girl that I probably teach. She’ll ask them a series of clipped questions: “White brown or wholemeal? Seeds or no seeds? Thick-sliced or thin?” and get them out of the way as soon as possible. When she takes your money she is making sure that the till balances and calculating the wages for the shift that she’ll spend on new shoes or a movie ticket or lunch at the dingy food court around the corner. But when you’re up early you get there before she has got out of bed. The shutters are still closed except for the one on the end. The ovens are still on and no one has booted up the cash register yet. In the early morning you get sold bread by a baker and this is an entirely different proposition. Firstly, for the baker, selling you bread is a novelty. He is up before the world and he would normally go home before any of his customers show up. To have you here—already!—to buy the bread before he has even finished baking is a rare privilege. He turns on the till and he doesn’t really know how long it will take to start. So you stop and have a chat. He’s excited that you’ve got a house full of sleeping relatives that will soon be surprised by his hot croissants. He doesn’t want to put the loaf of bread into a plastic bag because it will sweat. He admires the son you’ve got wriggling under your arm and slips you a couple of extra hot cross buns for him to enjoy. 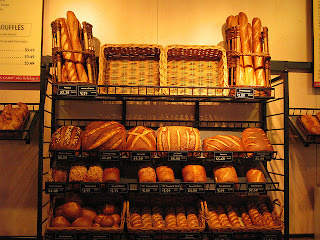 The baker’s attitude to his job is entirely different from someone who merely sells bread over the counter. If he thinks about the money you hand over at all, he thinks of it as something the he’ll buy flour with later to make more bread. The reason he wants to do what he is doing is so that you can eat the bread, so that the sleeping people in your house will smell the croissants when they wake up. As a job, teaching has aspects of both the baker and the counter-girl. When we’re checking school uniforms, or marking rolls, or telling kids to get back into bounds we’re mostly the counter girl: going through the motions because that is our job. The classroom can be the same if we’re not careful. If I’m teaching a text I no longer like, if I’m running down my spiel on essay writing without stopping to see if anyone is listening, if I’m waiting out the clock. The reason that teaching is a great profession is that, with a little effort, we can be the baker. We can be excited about what our students are learning. Our focus can be on them using and turning over their understanding later—perhaps much later when they have graduated and moved on with their lives. This is probably true of any half-decent job. So go down to your local bakery at about 5:30am and buy something hot from the oven, the baker should be an example to all of us. I hope at some point you pick this blog up again, because it's interesting peering through the eyes of a teacher, who can critically analyse their behaviour and work…I think sadly, many fail to do this. You were my English teacher from approx. 2006-2009 and I stumbled across this blog from your article about raising hands. Oh and by the way…thanks to you, I am a confidant public speaker who rarely relies on her notes…hell, I don't even need notes! Write some more!